This set of conference proceedings derives from the Information Literacy: Recognising the Need conference at Staffordshire University, 17 May 2006. 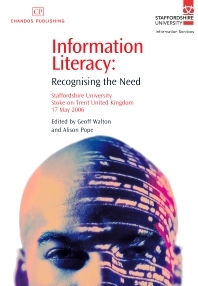 The papers in this book discuss key themes in information literacy and have been written by several renowned experts in the field. Information literacy is not just about finding information: it is a true catalyst for educational change. It enables independent lifelong learning. These papers consider the position of information literacy in the higher education arena, how students bewitched by easy internet searching can be engaged in the learning process and how information professionals and academic colleagues might move in partnership towards the information literate university. Why is Information Literacy important now? Information Literacy: the new “pedagogy of the question”? From institutions for teaching to institutions of learning? How does this affect Information Literacy? What do we mean by the Information Literate University? Geoff Walton is a Subject and Learning Support Librarian and Research Informed teaching (RiT) Project Co-ordinator at Staffordshire University, with specific subject responsibilities for Psychology and Sport & Exercise Science. As RiT Co-ordinator Geoff is involved in identifying synergies between research, teaching, learning, information literacy, e-learning and inquiry-based learning. He is particularly interested in the cognitive processes involved in becoming information literate. His research interests also include developing the online information literacy tool the Assignment Survival Kit (ASK), developing a process for online peer assessment, investigating academic skills needs in undergraduate students and using inquiry-based methods to facilitate learning. Alison Pope was a Learning and Teaching Fellow at Staffordshire University from 2005 to 2009. Her research in this period focused on the importance of adopting a strategic approach to information literacy in the HE context. She especially focused on the need to embed information literacy within the curriculum. Alison has spoken at many high profile conferences on this topic and has also published widely. She is Senior Subject and Learning Support Librarian at Staffordshire University with specific responsibility for the Schools of Law and Business. Alison leads the team at Staffordshire responsible for the development of the Assignment Survival Kit (ASK) and is currently engaged in empirical research to develop further the ASK software in a Web 2.0 environment.